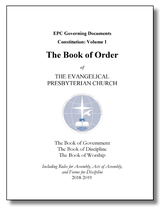 The EPC General Assembly Office provides a variety of downloadable resources, including EPC Book of Order, Westminster Confession of Faith, Leadership Training Guide, and others. Printed copies of many EPC documents are available from epcresources.org. The Presbyterian Story by S. Donald Fortson, III, D.Min., Ph.D., Professor of Church History and Practical Theology, Reformed Theological Seminary, Charlotte, NC. 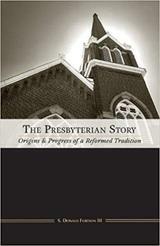 The Presbyterian Story is useful to elders, seminarians, church members interested in how the EPC fits into Presbyterianism in America. (Comes with a study guide which relates Scripture to history.) Click here to order. 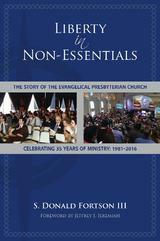 Liberty in Non-Essentials also by S. Donald Fortson, III, D.Min., Ph.D. A history of the EPC, celebrating 35 years of ministry: 1981-2016. Click here to order. 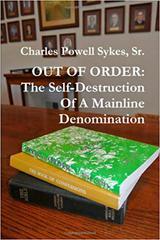 Out of Order: The Self-Destruction Of A Mainline Denomination by Rev. Powell Sykes, Westminster Presbyterian Church, Burlington, NC. In 1927 American Presbyterians chose to stop listing and insisting upon "the essential tenets of the Reformed faith"; instead, they emphasized tolerance and essential action. Since then, historic, biblically based Christianity has been supplanted more and more by a different religion, dubbed Religious Liberalism by the author, within the largest Presbyterian denomination in the United States. This, coupled with decades of removing practical means of holding pastors accountable for any of their beliefs and much of their behavior, is leading to that denomination's demise in the early years of the 21st Century. The author combines historical overview and perspective with his own experiences as a pastor of Presbyterian churches in North Carolina to make his case. Click here to order. Reformed with Power (How Reformed faith and Calvinistic theology flow with the power of the Holy Spirit) [Kindle Edition], by Rev. Tom Pittman. The Reformed faith and Calvinistic theology flow with the power of the Holy Spirit and His gifts. How does a reformed church exercise and govern the spiritual gifts today? Can any follower of Jesus flow with the power of the Holy Spirit? 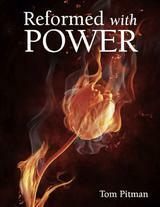 Reformed With Power is an apologetic and guide for the use of the manifestations of the Holy Spirit. Throughout his years in ministry, Tom Pitman has had fellow reformed pastors and church members ask him about the manifest presence of the Holy Spirit and His gifts. Through this work, he illustrates biblically, historically and logistically how the Holy Spirit has been actively using His gifts throughout time and how important they are for today. Click here to order. The Leadership Ladder Developing Missional Leaders in the Church by Steven Ogne & Kenneth Priddy. There are over 100 million people in our country who are not connected to any church. Research shows that growing churches grow on the edges of their ministries. They have active evangelism on the front edge and leadership development on the back edge. Ogne & Priddy make the case that when we raise up and multiply leaders, we are growing the capacity of the church to minister to more people in more and better ways. They outline a holistic pathway - The Leadership Ladder - to address the urgent need for multiplying missional leaders in our churches. Discover how this pathway could impact your church! Click here to order. 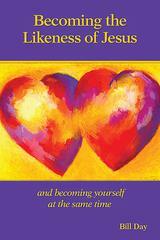 Becoming the Likeness of Jesus by Bill Day, PhD, LCSW, member of Fellowship of Christ EPC in Cary, NC. The Gospel is a multi-faceted diamond that reflects the Light of the world. One facet that rivets the attention of Christian believers is Jesus' sacrificial death, through which we are forgiven and redeemed: "Jesus paid it all," we say. However, there is another facet of this diamond, a facet of transformation. We can also say "Jesus took it all." This facet radiates a luminescent clarity that Jesus took upon Himself, onto the cross, our counterfeit "human nature." He took all the self-centered, prideful, rebellious dispositions of our hearts...as well as the wounds, afflictions, and abuses heaped upon us by the self-slants of others. In exchange, He gives us His life, i.e., true human nature. Becoming the Likeness of Jesus is a story about this forgotten facet of transformation, and is a guide for shifting from knowing about the facet into its actualization in daily life. It is "the rest of the story" in which you may find depths of discovery for your own journey towards healing, wholeness, and truth. Click here to order. 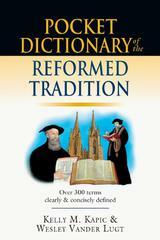 Pocket Dictionary of the Reformed Tradition by Kelly M. Kapic and Wesley Vander Lugt. Wes is Lead Pastor of Warehouse 242 in Charlotte, NC. The Pocket Dictionary of the Reformed Tradition is ready to assist you over the rough parts of readings, lectures, conversations and blogs. It will also be a companionable and concise introduction to one of the great Christian traditions. It would be beneficial for the PMA and the EPC in general, especially for candidates preparing for ordination. Click here to order. Living Theodrama: Reimagining Theological Ethics also written by Wesley Vander Lugt. Living Theodrama is a fresh, creative introduction to theological ethics. Offering an imaginative approach through dialogue with theatrical theory and practice, Vander Lugt demonstrates a new way to integrate actor-oriented and action-oriented approaches to Christian ethics within a comprehensive theodramatic model. This model affirms that life is a drama performed in the company of God and others, providing rich metaphors for relating theology to everyday formation and performance in this drama. Different chapters explore the role of the triune God, Scripture, tradition, the church, mission, and context in the process of formation and performance, thus dealing separately with major themes in theological ethics while incorporating them within an overarching model. 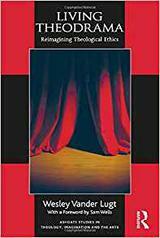 This book contains not only a fruitful exchange between theological ethics and theatre, but it also presents a promising method for interdisciplinary dialogue between theology and the arts that will be valuable for students and practitioners across many different fields. Click here to order. Dr. James Banks, Pastor of Peace EPC in Durham, NC, has written a number of books on prayer. 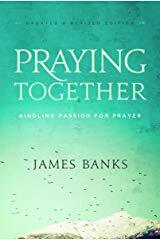 Praying Together by Dr. James Banks. The Bible shows many stories of people coming together in times of need, crying out to God in a spirit of unity, and seeing powerful answers to their prayers. Praying Together invites you to begin the adventure of prayer and watch God move like never before! 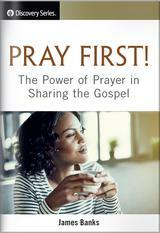 In this engaging guide to corporate prayer, you’ll examine the practices of the early church, and discover God’s presence and power today in fresh and exciting ways. You’ll find wisdom from Scripture, tips to help you build your confidence, questions for reflection, a guide for organizing a prayer group, and more. This book has also been translated into Chinese. Click here to order. Prayers for Prodigals by Dr. James Banks. When you're the parent of a prodigal, you know you can never pray enough. But how do you persevere when you're tired and discouraged? 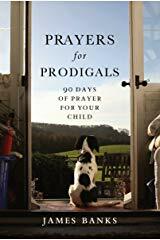 Prayers for Prodigals offers encouragement for parents to "come boldly before the throne of grace" and intercede daily for their children through a series of inspirational prayers. The book also includes fourteen brief reflections, which are drawn from Scripture and the writer's and others' personal experiences with prodigal children, such as Ruth and Billy Graham and Monica, the mother of Augustine. This unique and helpful book encourages and inspires parents in a sustained, daily prayer effort for their prodigal children. It has also been translated into Spanish, Dutch, Portuguese and Japanese. Click here to order. 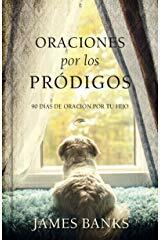 Prayers for Prodigals, Spanish Edition, Click here to order. Prayers for Your Children by Dr. James Banks. Many parents have witnessed the power of faithful prayer over their child’s life, praying for health and healing from heartbreaks and for spiritual awakening and future direction. 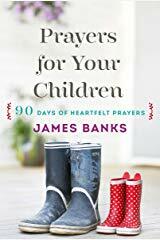 Inside Prayers for Your Children, pastor and bestselling author James Banks offers ninety accessible, Scripture-packed prayers you can pray for your kids during every season of their lives. Filled with heartfelt wisdom and truth, these ready-to-use prayers cover specific needs, including knowing Christ as Savior, loving the Lord and others, experiencing God’s protection, and walking in purity. Witness the power of prayer as you glean through the pages of this book and talk with God on behalf of your child. Also available in Chinese. Click here to order. Praying the Prayers of the Bible by Dr. James Banks. God offers an open invitation for His people to talk with Him, at any time and about anything. 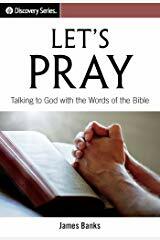 In Praying the Prayers of the Bible, James Banks provides a collection of prayers to help you engage in intimate conversations with the Lord. Taken straight from the Bible, these prayers will guide you in what to say as you worship and honor God and petition Him for you needs. Discover how to respond to God’s invitation and apply His Word to your life. Also available in Chinese. Click here to order. 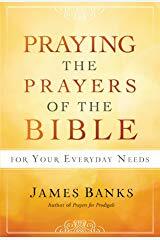 Praying the Prayers of the Bible for Your Everyday Needs by Dr. James Banks. The Bible shares many stories of the prayers of God’s people that express their circumstances and their trust in the One who never fails. Praying the Prayers of the Bible for Your Everyday Needs is a compilation of Scriptural prayers you can use—prayers to petition God for everything you need to live a life that will bring Him glory. This gift volume of prayers shows you how to talk to God, renew your trust in Him, and experience peace in knowing that He will take care of you. Click here to order. 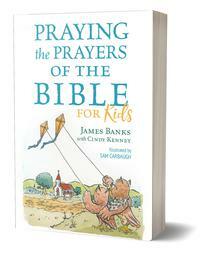 Praying the Prayers of the Bible for Kids by Dr. James Banks. God wants to have conversations with everyone—and that certainly includes kids! Praying the Prayers of the Bible for Kids helps you guide children in talking to God in more ways than just a simple bedtime prayer. Illustrated and designed for children ages 5-8, this engaging book presents simple prayers taken directly from kid-friendly translations of Scripture, focusing on praise, thanksgiving, faith, obedience, needs, and blessings. Written by bestselling author James Banks and Veggie Tales author Cindy Kenney. Click here to order. Pray First by Dr. James Banks. We all know people who need a relationship with Jesus. But we may secretly doubt that it will ever happen. Through humble, believing prayer we discover true power to reach others—God’s power to mercifully and faithfully move in response to our heartfelt please for those we love. In Pray First! Dr. James Banks shares specific ways to pray as well as encouragement to continue to kneel before your Father on behalf of others. A Discovery Series booklet available in bulk from Our Daily Bread. Click here to order. 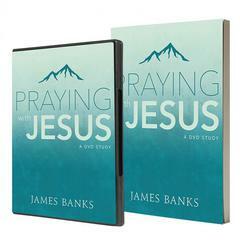 Praying with Jesus DVD and Study Guide by Dr. James Banks. The Bible says “the prayer of a righteous person is powerful and effective,” so what does it mean when prayers go unanswered? The Bible also tells us to “pray without ceasing,” but what does that look like in today’s fast-paced world? In this direct and personal DVD series, James Banks tackles these questions, and many more, in 6 concise sessions. 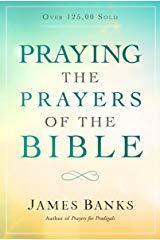 Biblical examples, from prayers of praise to “wrestling” prayers, reveal how prayer builds faith and brings people closer to the God of all creation. Paired with a thought-provoking study guide, Praying with Jesus is perfect for individuals, couples, families, and church groups. Click here to order. Let’s Pray by Dr. James Banks. As much as we want to talk to God, sometimes it’s difficult to find words that express the emotions of our hearts. Author James Banks shares prayers from biblical characters to show us how we can use God’s own Word to talk to Him through every season of life. This Discovery Series is available in several languages from Our Daily Bread. Click here to order. For those that were at the September 2018 Presbytery at Lake Forest Church, you would have heard Brent Campbell, the African American Staff member for InterVarsity Christian Fellowship that shared his story. Below is a letter to all of us from Brent willing to make himself available to any of you that would love to continue to grow your congregation in missional advancement toward Racial Reconciliation. Please reach out to him directly if he can assist you in anyway. Brent is also a Millennial that daily works with the “next generation” and filled with resources to assist as well in helping your churches grow in reaching the next generation. He’s been an invaluable resource to us at Lake Forest. Faith Inclusion Network's goal is to connect people with disabilities and their families to faith communities that are welcoming and genuinely want to include everyone. We also want to help faith communities become more inclusive by connecting them with resources and providing networking opportunities at conferences and meetings throughout the year. Presbytery of the Mid-Atlantic's own Michelle Munger is Peninsula Area Director for Faith Inclusion Network. Michelle has created www.accessiblechurch.org for the PMA. Check out the easy "getting started" suggestions as well as her blog. Michelle will help you work through this conversation. Contact Michelle with any questions you may have. Michelle Munger comes to the special needs community as the parent of two young men with autism. She and her husband Steven were married in 1996, weathered the active duty military lifestyle, and have settled in Virginia. She holds a Bachelor’s Degree in Family Development from American Military University and a Masters in Religious Education from Liberty Baptist Theological Seminary. She has served in a variety of military and civilian church staff positions including Ministry Assistant, Director of Religious Education (serving both catholic and protestant chapel congregations), Youth Director, and Preschool & Children’s Ministry Director. Michelle Munger is also available ot help PMA churches develop or enhance their website and social media presence. Michelle manages several websites herself and uses social media to coneect people and help communicate the Good News! She has written a Social Media Primer to help churches. Michelle has generously offered to help PMA churches. Please contact Michelle with any questions you may have. Download the Social Media Primer here.